We are a people-focused business providing contact center services, integrated marketing solutions, big data analytics, and back-office processing. We improve your customers’ experiences through dedicated, tenured staff. We provide training, personal development and support to our employees helping them achieve their full vocation as employees and humans. In turn, they deliver innovative solutions that exceed our clients’ business needs. Making lives better is not just a goal – it is our mission and our differentiator. Our high retention rates are a direct result of our philosophy. We want our employees to succeed and feel supported in their roles, with room to grow. Having less turnover is in turn beneficial to you and your customers, who are met with a well-equipped, knowledgeable staff. 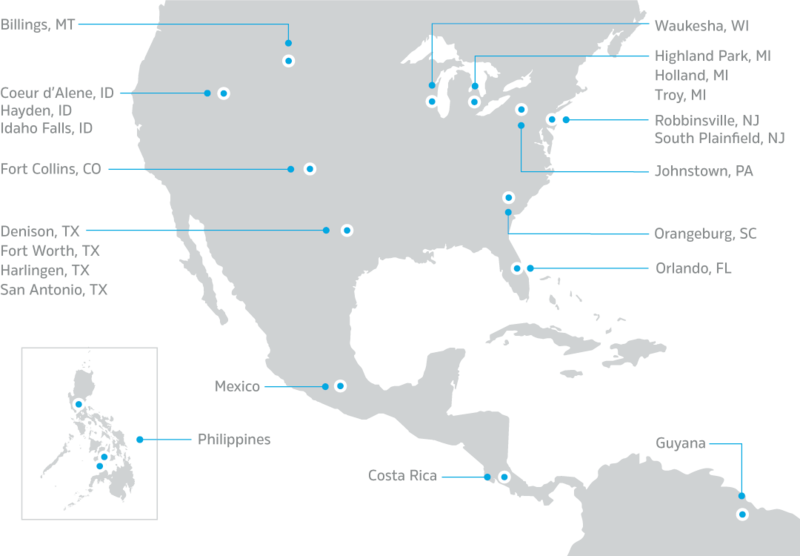 We have locations throughout the U.S., as well as in Mexico, Costa Rica, the Philippines and Guyana. These locations are strategically placed for our customer’s benefit. As a Six-Sigma organization, we constantly improve and update our best practices; however, we know one-size does not fit all. We tailor our solutions to each client, which means we are able to provide the best services possible at the right price. Be the Best BPO. Make People’s Lives Better. Our international reach, combined with our Six-Sigma approach and people-first perspective equates to customized, quality services at a competitive price. We have a dedicated Mission Office whose sole purpose is making our employees’ lives better. Individual programs promote caring, giving, learning, communication and fun at work. Significant portions of our revenue are dedicated to the Mission Office to positively impact employees, their families, and communities. We measure outcomes with more than just statistics. When we help develop successful people with fulfilled lives, we achieve our mission.